Scenario: The end of the world has arrived. 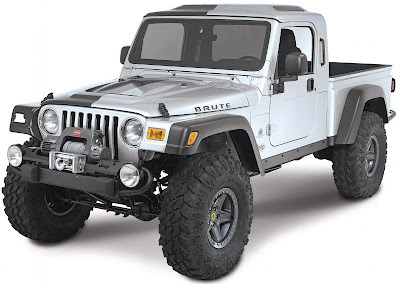 Chaos, martial law, etc... Answer: The Jeep Brute. I mean, if you gotta run down hordes of fleeing refugees chasing you for some of the last drops of gasoline, might as well look good doing it. This bad boy is a conversion kit sold by American Expedition Vehicles (AEV). You take your stock Jeep Wrangler, throw $9k at it and a few hours wrench time and out pops this beast. It's been one of my favorites for a while. The one below shows the body mod panels.